Cumbernauld Colts moved up to third spot in the Lowland League table with victory over Whitehill Welfare at Broadwood on Saturday. 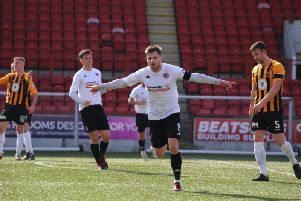 Two goals in two second half minutes from Greg Pascazio and Sean Brown did the damage for the Cumbernauld men to move them just three points adrift of leaders Spartans with a game in hand. Colts started well and in the first couple of minutes Livingston loanee Craig Henderson headed narrowly from Fraser Team’s cross. The visitors seemed content to sit deep and threaten on the odd counter attack and Colts struggled to find their usual tempo in the early exchanges. But they did create another good opening in 23 minutes when Brown and Team linked up superbly inside the box, but Team’s low shot was pushed around the post by visiting keeper Ross Jardine. Two minutes later they came even closer. Team and Stephen O’Neill combined well this time before O’Neill whipped a dangerous cross which defender Sean Lally, attempting to clear, sent crashing against the bar with Jardine stranded. After the break Colts upped the pace and made the breakthrough in 56 minutes. A sweeping move forced a corner and from O’Neill’s inswinger skipper Pascazio sent a downward header flying past Jardine from close range. Two minutes later Pedram Ardalani threaded a clever ball through to Brown and the big striker showed great composure to slide the ball past Jardine from 12 yards. Colts continued to push forward and Team, Brown and Pascazio all went close in the final quarter. The hosts did have the ball in the net again in 85 minutes when Team finished off a lovely Colts move, but the ‘goal’ was ruled out for offside against O’Neill in the build-up. James Orr and Craig McKinlay’s men had to settle for the two goal margin, but they now look forward to meeting University of Stirling at Broadwood tonight (Wednesday) knowing three points will take them joint top of the table.